One of the first things that I learned from B (my social work mentor), many years ago as an intern doing home care to geriatric patients was to avoid the soft furniture. As recommended by B, whenever you do a home visit always shoot for the hard, wooden furniture. It was advice well taken. Two of my most prominent memories of from the experience was the smell of incontinence and the sight of an exploding medication stash. Yes, I should be running marathons with all this stuff. It started off simple; oh, vitamin C will help with the common cold. 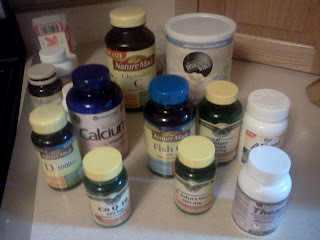 At one time I added vitamin E, too, but I no longer take that one. Every educated person today knows that you need Omega 3s, so fish oil, check - got it. Let's not forget the CoQ-10, which is essential to counteract the side effects of the prescribed cholesterol medication (statin). I have a bit of seasonal depression so got to have the St. John's Wort plus add a bit of D3 for good measure. But wait, I read that D3 by itself was no different in some study against a placebo... hmmm, what to do? Good news, a new study, Calcium plus D3 seems to be better - oh yeah, a two-fer! I was feeling a bit draggy in the morning so I thought maybe if I add some protein. So I added the protein, but I think I might have a bit of milk intolerance... good thing I have the Ginger Root to settle down the stomach! I've been under a bit of stress lately; good thing I watched a few minutes of Dr. Oz a few weeks ago - that and a few minutes on Amazon.com and I'm good to go with some Theanine... and just in case I missed anything, I have a multivitamin - "Alive! Men's 50+" - it sounded good, but it seems way too strong - I split it in half and take it very sparingly. so I wonder, are 30 somethings also taking these pills OR am I officially on my way to being "old people?"